We are now 24 hours away from the 2015 Hawaii History Bee and Bowl State Championships scheduled to be held at ‘Iolani School in Honolulu on Saturday, February 28. The Pacific Learning Consortium and History Education Hawaii, Inc., the Hawaii affiliate of the National Council for History Education, are co-sponsors of this fantastic event that has been held here since 2011. There will be seven teams from Iolani with others from Punahou School, Kalani High School, Pearl City High School, Hawaii Baptist Academy, with Kapolei Middle School expressing interest. You are invited to attend The Civil War and Popular Culture: Some Trends by Randal Allred, Professor of English at BYU-Hawaii. Professor Allred's presentation is scheduled for this evening, February 25, 2015 at the USS Bowfin Submarine Museum at Pearl Harbor. Attendees are requested to arrive at 6:00 p.m., with the lecture to begin at 6:30 p.m.
You can park at the Arizona Memorial and enter through the main visitor’s center entrance (no bags) OR park by the Bowfin and enter through its rear entrance since it is after hours. Bring Harvard's Peabody Museum into your Classroom! We invite our history education colleagues to bring our museum into their classrooms this winter with our new King for a Day program. We have developed this new live, interactive webcast program using Skype to highlight the monuments, buildings, and symbols associated with royal power in Maya and Aztec civilizations. The Peabody Museum of Archaeology and Ethnology is one of the oldest and largest anthropology museums in the country with 100+ years of experience in Mesoamerica. We collaborated with Vermont 6th grade classrooms to fine tune the program and invite teachers across the country to check out the webpage to see if the experience supports their classroom work on the Maya and Aztec civilizations. Through the Skype webcast, students learn to read the built landscape to understand the responsibilities and benefits of leadership. A museum educator brings a video camera into the exhibition to show examples of a codex, architectural models, rare stele, altars, and an obsidian sword as he asks and answers student's questions in real time. A companion PowerPoint slide show provides maps and photographic support to put the artifacts in context. The program brings Harvard exhibits, artifacts and staff to your classroom for a fraction of the time and cost of a face-to-face field trip. For more information, costs and FAQ visit this link or contact Reservations by phone at 617-495-3216 or email here. The Honouliuli Internment Camp (Honouliuli) serves as a powerful reminder of the need to protect civil liberties in times of conflict, and the effects of martial law on civil society. Honouliuli is nationally significant for its central role during World War II as an internment site for a population that included American citizens, resident immigrants, other civilians, enemy soldiers, and labor conscripts co-located by the U.S. military for internment or detention. While the treatment of Japanese Americans in Hawai'i differed from the treatment of Japanese Americans on the U.S. mainland in ways that are detailed below, the legacy of racial prejudice, wartime hysteria, and failure of political leadership during this period is common to the history of both Hawai'i and the mainland United States. Early on December 7, 1941, Japanese air and naval forces attacked Pearl Harbor and other military installations on O'ahu. Before martial law was invoked, government officials began selectively rounding up Hawai'i residents on suspicion of disloyalty. They were confined at local jails, courthouses, and other facilities on six of the main Hawaiian Islands before being transported to the U.S. Immigration Station and Sand Island Detention Camp on O'ahu. Nearly all of the internees were of Japanese descent, including leaders in the Japanese American community who were educated, were teachers or priests, or were distinguished by virtue of their access to means of communication with Japan or to transportation from Hawai'i. Most would be sent to the mainland to be held for the duration of the war in Department of Justice and War Relocation Authority camps. Despite the government's allegations of disloyalty, none of the Japanese American internees from Hawai'i was ever found guilty of sabotage, espionage, or overt acts against the United States, and all later received formal apologies and many received redress compensation from the United States. On the Island of O'ahu, the U.S. War Department sought a place removed from the active combat areas of Pearl Harbor for internment of individuals. The War Department chose Honouliuli Gulch, the bottom of which was hidden from view by the gulch's steep walls. The Honouliuli Internment Camp opened on March 2, 1943, with the transfer of internees from Sand Island and rapidly swelled in population with the influx of prisoners of war. 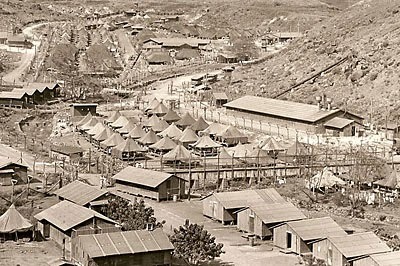 Managed by the U.S. Army, it was the largest and longest used confinement site in Hawai'i. Honouliuli is significant for having been used as both a civilian internment camp and a prisoner of war camp, with a population of approximately 400 civilian internees and 4,000 prisoners of war over the course of its use. 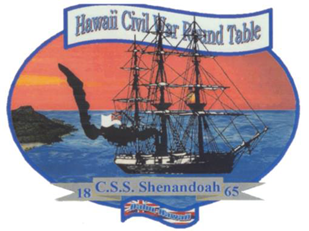 Honouliuli was divided into seven compounds: one compound for administration and guards, one for civilian internees, and eventually five compounds for prisoners of war. The civilian compound was further divided into sections for male civilian internees of Japanese ancestry, female civilian internees of Japanese ancestry, and civilian internees of European ancestry. Historic documents indicate there were 175 buildings, 14 guard towers, and over 400 tents among the 7 compounds on 160 acres. Many internees referred to Honouliuli as Jigoku-Dani (Hell Valley) because its secluded location at the bottom of a deep gulch trapped heat and moisture and reinforced the internees' sense of isolation and unjust confinement. The majority of Honouliuli's civilian internees were American citizens or permanent resident aliens -- predominantly Japanese Americans who were citizens by birth -- interned on suspicion of disloyalty. The remaining group comprised predominantly German Americans, though there were also Americans and aliens of Italian, Irish, Russian, and Scandinavian descent. Honouliuli also held women and children who were Japanese civilians displaced from the Pacific. The 4,000 prisoners of war in Honouliuli included enemy soldiers and labor conscripts from Japan, Korea, Okinawa, Taiwan, and Italy. The prisoner of war compounds were guarded by an African American infantry unit as well as units of Japanese Americans from the mainland. Honouliuli closed in 1945 for civilian internees and in 1946 for prisoners of war. With the closing of the camp, fast-growing vegetation quickly took over the site. Honouliuli was forgotten as Americans celebrated the victories of World War II and focused attention on the valor displayed by Americans at Pearl Harbor and abroad. While both mainland and Hawaiian internment camps are sobering examples of wartime prejudice and injustice, Honouliuli reminds us of the differences in the way that forced removal was approached in Hawai'i and on the mainland. The primary difference between the Japanese American experience on the mainland and on Hawai'i is that the internment in Hawai'i targeted a relatively small percentage of the ethnic Japanese population on the islands. Less than one percent of Hawai'i's ethnic Japanese population was interned in Hawai'i. This contrasts with the mass exclusion of all 120,000 Japanese Americans on the West Coast of the mainland. In Hawai'i, the Japanese American citizenry and immigrant population were over one third of the territory's total population. Without their participation in the labor force, the economy of the territory could not have been sustained and the war effort in the islands would have been crippled. Both the policies in Hawai'i and those on the mainland devastated Japanese Americans and their families and created a social stigma that was borne by Japanese Americans during and after the war. The selective nature of the internment in Hawai'i also sowed division within the Japanese American community in Hawai'i, leading to ostracism and other backlash against the targeted individuals and their families that would last their lifetimes. The declaration of martial law served as the basis to authorize internment in Hawai'i, as opposed to the mainland where mass exclusion was authorized by Executive Order 9066. During the period of martial law from December 7, 1941, to October 24, 1944, the U.S. Army issued hundreds of military orders, some of which were applicable only to persons of Japanese ancestry and enemy aliens. For example, people of Japanese ancestry were restricted from residing in certain areas of O'ahu and were forcibly removed from their properties. These types of discriminatory policies created an atmosphere of fear and suspicion. Finally, Honouliuli is significant because of the comparatively lower level of public understanding and awareness of the history of internment of civilians in Hawai'i during World War II. On the mainland during World War II, mass exclusion was well known. In contrast, the internment in Hawai'i was largely kept secret during World War II, and has only recently become the subject of scholarship and awareness campaigns. It was not until 1998 that information about Honouliuli resurfaced. After 4 years of research and exploration, the site was uncovered in 2002. In 2008, an archeological research survey was conducted at the site. Honouliuli remains an object of archeological interest. Honouliuli serves to remind every American about the critical importance of safeguarding civil liberties and maintaining our values during times of crisis. It is important to recognize Honouliuli as a part of our shared national heritage and national consciousness. It is a place to reflect on wartime experiences and recommit ourselves to the pursuit of freedom and justice. WHEREAS it is in the public interest to preserve and protect the historic objects at Honouliuli; NOW, THEREFORE, I, BARACK OBAMA, President of the United States of America, by the authority vested in me by section 320301 of title 54, United States Code, hereby proclaim the objects identified above that are situated upon lands and interests in lands owned or controlled by the Federal Government to be the Honouliuli National Monument (monument) and, for the purpose of protecting those objects, reserve as a part thereof all lands and interests in lands owned or controlled by the Federal Government within the boundaries described on the accompanying map entitled, "Honouliuli National Monument," which is attached to and forms a part of this proclamation. The reserved Federal lands and interests in lands encompass approximately 123.0 acres, together with appurtenant easements for all necessary purposes. The boundaries described on the accompanying map are confined to the smallest area compatible with the proper care and management of the objects to be protected. All Federal lands and interests in lands within the boundaries described on the accompanying map are hereby appropriated and withdrawn from all forms of entry, location, selection, sale, leasing or other disposition under the public land laws, from location, entry, and patent under the mining laws, and from disposition under all laws relating to mineral and geothermal leasing. The Secretary of the Interior (Secretary) shall manage the monument through the National Park Service, pursuant to applicable legal authorities, consistent with the purposes and provisions of this proclamation. The Secretary shall prepare a management plan for the monument, with full public involvement, within 3 years of the date of this proclamation. The management plan shall ensure that the monument fulfills the following purposes for the benefit of present and future generations: (1) to preserve and protect the objects of historic interest associated with Honouliuli Internment Camp, and (2) to study and interpret the history of World War II internment and detention in Hawai'i. The management plan shall set forth the desired relationship of the monument to other related resources, programs, and organizations associated with World War II internment, detention, and exclusion. IN WITNESS WHEREOF, I have hereunto set my hand this twenty-fourth day of February, in the year of our Lord two thousand fifteen, and of the Independence of the United States of America the two hundred and thirty-ninth. Last week we announced that the 2015 Hawaii History Bee and Bowl State Championships would be held on Saturday, February 28 at Iolani School. Both History Education Hawaii and The Pacific Learning Consortium have been co-sponsors of this fantastic event. It's fun, and the students are quite passionate. The competition is modeled after the TV 'Jeopardy' game show. You'll be pleased to hear that Iolani School's winning team placed among the top-five competitors in last year's national championships! We're asking for your help in raising funds to underwrite the cost of lunch and soft drinks for the students and teachers who donate their time and efforts to make this event successful. Our goal is to raise $250-$300 in donations. We can accept cash, checks or electronic transfers via this Eventbrite link. 1) For a $25 donation your name -or that of your business- will be featured in a "thank you" acknowledgement on History Education Hawaii's news-blog as well as the Pacific Learning Consortium's. 2) For a $50 donation we will feature your name or your business in the two news-blogs as well as a personally signed 'thank you' card or letter by the winning team's members. 3) For a $75 or more donation you will receive both of the above and I will send you a bag of Hawaiian-blend coffee -good for those of you in colder winter climes across the U.S. mainland! Our deadline for receiving donations is Thursday, February 26 at 4:00 p.m., Hawaii Standard Time. Paper check payments will be processed by The Pacific Learning Consortium. Please send your donation to the PLC at P.O. Box 183, Honolulu HI 96810-0183. Here's a suggestion for those of you on Oahu. We invite you to provide a potluck food and/or drink selection for the students and teachers. You'll be invited to attend the competitions, too. Bring your cameras! Be prepared to have fun! Comments? Questions? Please contact us at HistoryEducationHawaii@gmail.com or call 808-721-0306. 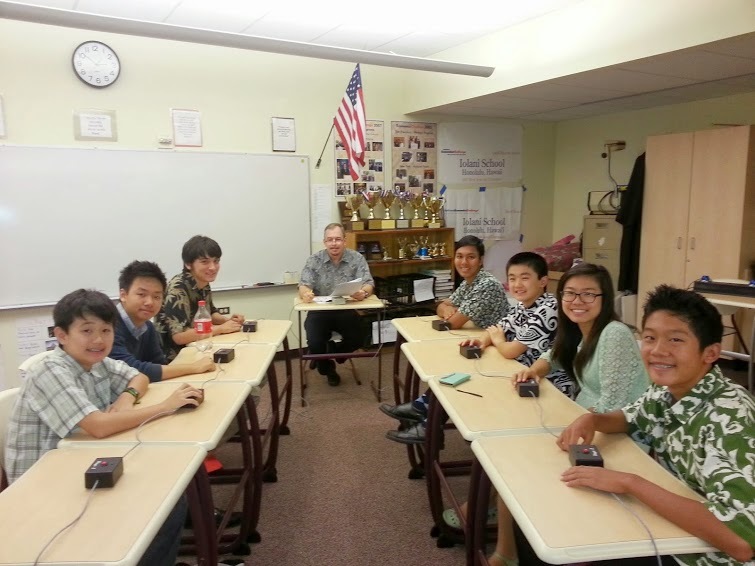 Hawaii History Bee & Bowl State Championships Saturday, February 28! The Hawaii History Bee and Bowl Championships are coming! They will be held at ‘Iolani School, 563 Kamoku Street, Honolulu on Saturday, February 28. Doors open at 8:00 a.m., with the opening meeting scheduled for 8:45 a.m. Question Set B will be used. The rounds will conclude on or before 5:30 p.m. This the tournament does NOT require prior qualification! The tournament schedule is posted here, while the registration is here. Students are welcome to compete with a parent or other adult chaperoning them, or, if they come just for the History Bee and/or the exams during the lunch break, they don't need a chaperone at all. Note that there is a separate middle school division for this tournament. This tournament will also feature a Middle School division for the Bowl (middle school students will compete as JV in the Bee). For more information, please visit the Middle School Bowl site. We are accepting donations to underwrite lunch for the students. Please contact us at historyeducationhawaii@gmail.com or call (808) 721-0306. The Pacific Coast Branch of the American Historical Association is scheduled for August 6-8, 2015. Both the annual meeting and conference will be held in Sacramento, California. We are awaiting further information regarding registration, exact location, hotels and other important details. We urge you to monitor the PCB-AHA's web site here. African American Diversity Cultural Center Hawaii: "Hawai`i and Civil War"
On Tuesday, February 3, 2015 a panel discussion, "Hawai`i and Civil War," will be held at the Honolulu Hale Municipal Gallery, 530 S. King Street. An exhibit will be displayed there February 1-20, 2015. Opening ceremonies start this coming Tuesday at 4:30 p.m. and conclude at 6:00 p.m.
Panel discussion members include Dr. Justin Vance, Nanette Napolean, Research & Anita Manning, Researcher. For more information call 808-597-1341. Sponsored by the Mayor's Cultural & Arts, African American Diversity Cultural Center Hawaii in collaboration with Hawaii Sons of Civil War.